Encourage students to read, using classroom iPads and a good e-reader app. E-reader apps for iPad support many e-book formats, and e-books are easily found many for free, or low cost especially literary classics that are no longer copyrighted. E-books can be read on the iPad using your choice of a variety of e-reading apps. 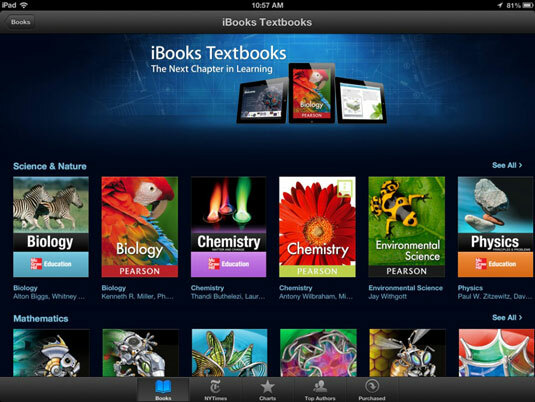 Each app has a unique set of features and often its own store for buying the books. Compare them and select the one that suits your classroom needs. 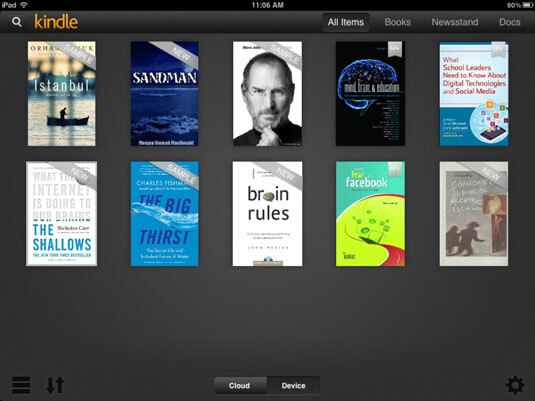 iBooks is the native e-reading app for the iPad and the most popular book-reading app for users of any Apple iOS device. It’s designed specifically for iOS use and cannot be used on other platforms. One of the app’s strengths is that it’s the only one on the iPad that has a built-in bookstore for browsing and in-app ordering of books. In most cases, you can download samples to read before buying the book. To be fair, some of the other major e-reading apps had in-app purchasing in earlier versions; they were required to remove it from their iPad versions. iBooks has improved steadily with new releases and is a solid choice for reading on the iPad. The capabilities to change color schemes, increase and decrease font sizes, keep notes, annotate text, and more have made iBooks the standard e-reading app on the iPad. Amazon offers an e-reading app the Kindle app that can be used on other devices. Amazon has the advantage of offering the largest selection of paid e-books available, with more than a million titles in its inventory. Download the free Kindle app to your iPad, and when you purchase an e-book on Amazon.com, you have the option of downloading it to the Kindle app on your iPad. Unlike some e-reader apps for iPad, using the Kindle app, you can also purchase hundreds of newspapers and magazines and download them to your iPad. The Kindle app is available on a wide variety of devices, including Android devices, Windows Phones, iPhones, Windows PCs, and Mac PCs. In addition, the Kindle’s WhisperSync feature saves your last page read, bookmarks, and notes so that you can pick up any other device and synchronize with where you left off on another device. Amazon also offers free samples for download so you can review books before buying them. Barnes & Noble offers an e-reading app called Nook that can be used on iOS and Android devices. Barnes & Noble created the Nook app to promote and bolster its sales of e-books. Barnes & Noble offers a large selection of paid and free e-books, as well as magazines and newspapers. The free Nook app is also available for your Mac, PC, and smartphones, and it syncs your reading status between devices. Unfortunately, B&N hasn’t yet found a way to deliver a hot cup of coffee and pastry with the book. 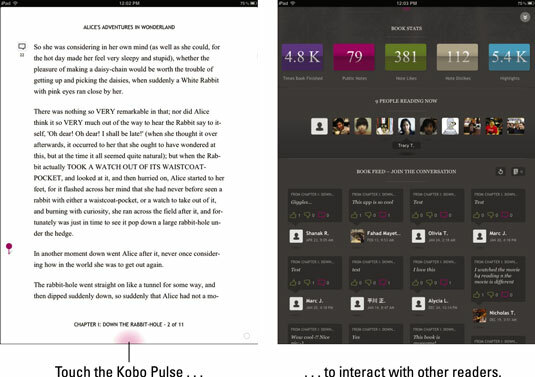 Kobo e-reading app shares many features with other e-reading apps. You can purchase books from Kobo’s online store; it has apps for several devices (including the iPad and iPhone); the app synchronizes your account between your devices. You also can change text size, add notes, annotate text, and more. What really distinguishes Kobo from other e-reading apps, though, is its Reading Life feature. Reading Life is an example of a new trend called social reading. You’re probably familiar with social networking possibly the most powerful phenomenon sweeping the Internet and it has reached the world of reading. You may think of reading as a rather solitary activity, but book clubs have been around for a long time. Book club members meet in someone’s living room and, over a drink and some snacks, discuss a book everyone has read. The advent of social reading is born out of book clubs . . . except in a social reading club, you can meet any time of day you want, at any place you happen to be, and discuss books with countless readers from all across the planet. You just have to bring your own tea and snacks. Kobo is one of a new generation of e-reading apps that is moving the social networking experience into the realm of book reading. Tap the cover of any book in your library and let your friends on Facebook and Twitter know what you’re reading. Select any text in the book and then post and share it along with your comments on your social networking sites. Who is currently reading the book. Any comments that have been left. How many people have liked the book. In addition, you can add comments of your own or reply to other comments. Tap the top menu bar on your Kobo home screen or bookshelf to reveal the Reading Life icon. Tap it to explore statistics about your reading. Find out how long you have been reading, the average pages per hour, time you take to read a book, and more. Sign up with your Facebook account and see what your Facebook friends have been reading and recommending.